Google Review posted by Sean M.
✔ I recommend Richard Vaznaugh. ✔ I hired Richard in 2013. ✔ Richard handled my Employment / Labor matter. “Faced with the distress and humiliation of losing my job due to disability discrimination from my former employer of over 13 years, I was referred to Richard by a friend. From my our first meeting, I knew I did not need to look further. During our first consultation, Richard spent nearly two hours discussing high-level details surrounding my case, asking thoughtful questions and providing insight as to points to consider if I chose to pursue a legal matter with my former employer. He carefully vets each case before deciding to represent clients so that he provides the utmost attention, focus and investment to ensure a successful outcome. Believe me, this is no legal “chop shop”, and I am very thankful for the unparalleled quality and service he and his team provided. The process Richard and I followed was an interactive one. He constantly kept me informed as to progression of the case, educated me on steps I needed to take and more than adequately prepared me in achieving milestones such as completing paperwork, organizing documentation for his review, etc. He provided clear explanation of complex legal processes, terms, etc. so that I was more than ready for the twists and turns my former employer presented. He and his more than capable staff invested countless hours day and night meticulously poring over documents, communication, facts and figures surrounding my case in building a solid, firm foundation. This process resulted in my presenting a solid argument against my former employer. Ultimately, his patient support and collaboration helped to reduce uncertainty and ensured I was more confident and clear-headed during the deposition process. Mr. Vaznaugh was also incredibly compassionate and showed a genuine concern for my well being. He indulged my panicked, anxiety-laden emotions with calm, strength and encouragement, refocusing me on the facts and building my confidence when I needed it most. I cannot thank him enough for showing this truly authentic and “human” side. It was invaluable to me. I’m fairly sure Richard is a Jedi. The process took some time but in that time I didn’t have to lift a finger, he went to bat for me each day to help me and in the end got win my case. If you have a labor problem and are in need of an amazing lawyer, call Richard. Richard Vaznaugh has great expertise in his field as well as great understanding of his clients’ needs. His help enabled me, one person, to take on a world famous, multi-billion dollar company and win. If you have good cause, he will get the job done. Richard’s help had made a profound change in how I view my workplace. My case allowed me an opportunity to see the bad side of the company I was suing but ironically also the good. Richard gives lawyers a good name. ✔ I have previously worked with 3-5 lawyers. Richard was efficient, hard-working and very responsive. He does not posture but relates in a compassionate and conscientious way. He has a great sense of humor which diffuses tense situations. I had an extremely complicated case – my boss had stolen money from me and from the company. Subsequently, I got sick on the job and was put on unpaid personal leave and as retaliation to my whistle blowing was forced out. Richard worked out a fair settlement, he made sure every “t” was crossed and “i” was dotted. He calmly cut through all the smug obfuscations, mean-spirited bluster and outright lies lobbed by the other side. I would certainly recommend him and use his services again. ✔ I have previously worked with no lawyers. I found Mr. Vaznaugh on the Internet. I posted my case and Mr. Vaznaugh responded to me. I used to work for 18 years as an assistant manager for a large retail corporation. I became partially disabled and my employer wrongfully terminated my employment. 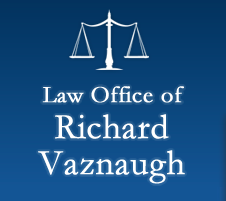 After numerous rejections from other attorneys who were unwilling to take on such a powerful opponent, Richard Vaznaugh exhibited firm confidence in my case from the beginning. Not once I had a feeling of insecurity about my choice of attorney. He guided me through the many steps of this legal dispute with a clear vision, always having the right move ready to counter the legal moves of my employer’s legal team. He kept me informed, never sparing time to explain our course of actions. He possesses formidable legal acumen allowing him to be determined to go all the way even with a large case like mine. Eager to take my case to trial, he pushed my employer to the point where they ultimately succumbed and agreed to my demands of the settlement. Not only was I extremely satisfied with Mr. Vaznaugh’s legal services, he helped me through a very difficult time of my life. Posted by a Discrimination client. ✔ Richard handled my Discrimination matter. He contacted me the same day I sent the request for assistance. He was very helpful and put me at ease immediately. He advised me through each step of the process and made me feel like I was an important and integral part of the case, not just another client or number. With his skill, we won the case during mediation and avoided a long, drawn out case. I was very satisfied with his services. Posted by a Discrimination client in 2008. I met Mr. Vaznaugh through a friend’s referral. He was his former client and was very satisfied with his service. I had two prior attorneys, one was not helpful, the other did not want to file my case in court. I hired Mr. Vaznaugh after my first consultation. He understood my needs. My discriminatory layoff and overtime case lasted more than a year, and during the period, Mr. Vaznaugh always gave me prompt and clear reply whenever I had questions for him. He is very experienced and knowledgeable in his legal area, and guided me well in the whole process. At the final stage of my case, i.e., the most important negotiation between the two sides, he penetrated my employer’s lay-off defense and played a big role in obtaining a good compensation for me which was considerably more than I expected. I could not thank him more for his great job. For those who struggled with workplace discrimination, I would highly recommend Mr. Vaznaugh. Former Client: Machinist and Production Manager, San Leandro, CA. San Francisco Superior Court Judge Ernest Goldsmith, Hearing on Attorney’s Fees Compensation, July 11, 2008. Read the excerpted discussion here. State Bar Rules require us to disclose that past performance does not imply, guarantee, warranty or predict the outcome in any future legal matter.